Do you have a young truck lover in your casa? Then you might be interested in this series by Candlewick Press. 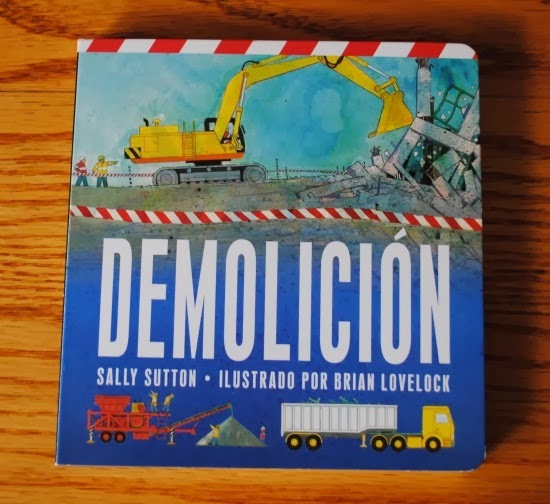 The series by Sally Sutton has been translated into Spanish and the latest board book is Demolición, a book for little truck lovers. 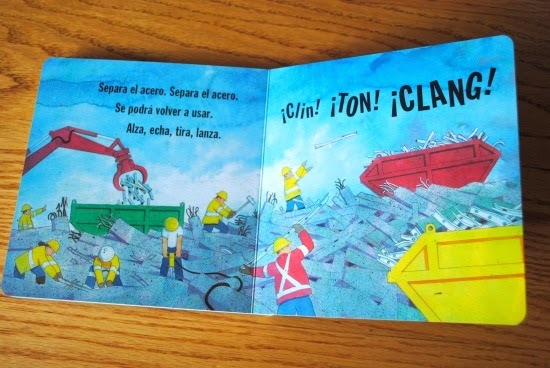 This fun little board book describes the process of demolishing a building from start to finish. The illustrations are colorful and full of action, complementing the text perfectly. Each double page focuses on a different aspect of tearing down the building - and most of them feature big trucks and tractors, such as trackhoes and cranes. The words follow the same three-line pattern, and young children will benefit from the repetition. Gira la bola. Gira la bola. Haz que caiga cada piso. Dale al muro. Dale al muro. This book is great for toddler and preschoolers who are building their vocabulary and learning pre-literacy skills. And it is sturdy enough for curious little fingers who sometimes drop things. This title will be released on February 11th, but you can pre-order it on Amazon.com. Psst...There's a Big Sale Going On!